From an unbylined article in the October, 1951, issue of "Gentlemen of the Press", the newsletter of the Washington State Press Club. Don't let the name "Ale & Quail Society" mislead you . . . Organized shortly after the war by a group of the younger men of the Washington State Press Club, the Society was mainly a political group, aimed at placing "young blood" on the Club's Board of Governors. Shortly after elections, in which its aims were achieved, the Society became somewhat dormant. Then in the fall of 1949 the Society became active once again, this time with an entirely new objective ... to have fun . . . and, to boost the Washington State Press Club. Bob Callan, then with the Fur Journal and now with the Navy in Washington, D. C., became president. Through his guidance, the group undertook numerous activities such as special club events, weekly noon luncheon programs, "Young Man of the Year" awards contest, special "caravan" trips, the "Davy Jones" operation of Seafair, and active participation in the Clubs Gridiron Shows. 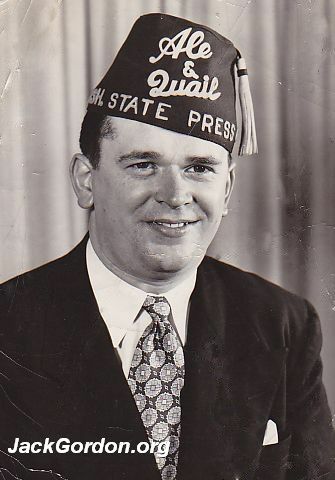 John T. Closs, Seattle Times photographer, succeeded Callan as president in 1950 and carried on the Ale & Quail activities until he was succeeded by Ed Simonds, Chamber of Commerce publicity man, last spring. "Regardless of what the P.-I. says," said President Simonds, "we are out to have one H ... of a good time, yet at the same time do everything we can to boost the Press Club. Primarily, we are a booster group, even though we do get embroiled in politics now and then. Anything we do to focus favorable attention upon ourselves—such as the highly popular Davy Jones operation of the first two Seattle Seafairs — also focuses favorable attention upon the Press Club. It helps all concerned." Closs is vice-president of the Society, Harry Patton, formerly of the U. of W. Public Relations Department and now of Boeing, is secretary and Kermit W. Nelson, Sears Roebuck & Co., is treasurer. Taking the helm of the Society in early days were such Press Club "wheels" as Jack Gordon, Greater Seattle, Inc.; Doug Billmeyer, West Coast Airlines, and Harlowe Hartung [ed: printed in error for Marlowe], local ad agency man.